This is a long post, so I’ve added a few bookmarks if you’d like to skip to a particular section. Why did I look forward to 14 hours of hiking with almost a vertical mile of elevation gain in mostly exposed terrain where temperatures reached up to 90 degrees Fahrenheit on a trail that has a website dedicated to cataloguing deaths and injuries resulting from the trek? 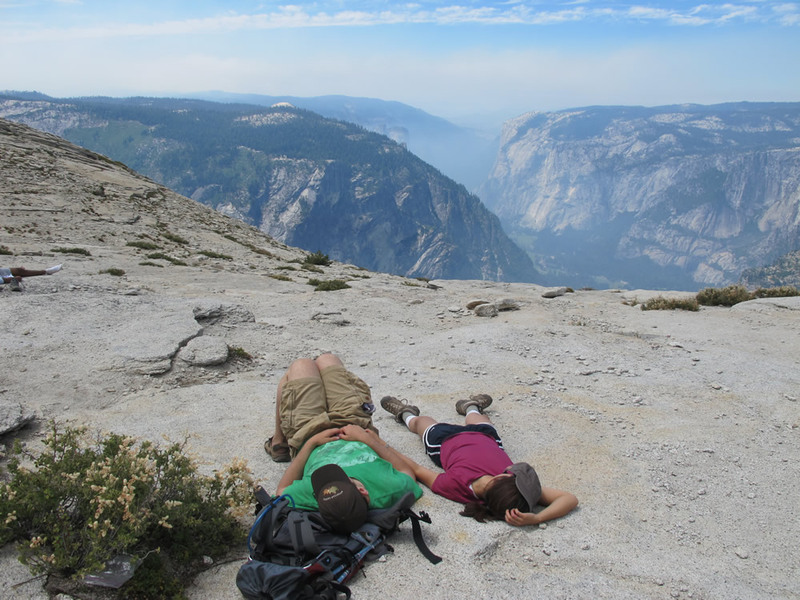 The Half Dome hike in Yosemite should be on everybody’s bucket list. No pictures can get across how breathtaking the views are and no words cannot describe the sense of triumph when you set foot on that summit – though I sure will try. What does it take to get here? Fitness level: You need to be in good physical condition to do this hike. No, you don’t have to have the endurance of a marathoner or have completed P90X like some reviews might say. But you will be gaining 4800 feet, or almost a mile, in vertical elevation – and for the last 400 feet you need to have enough strength left to haul your body weight up cables on a 45-degree incline where there’s absolutely no room for error. 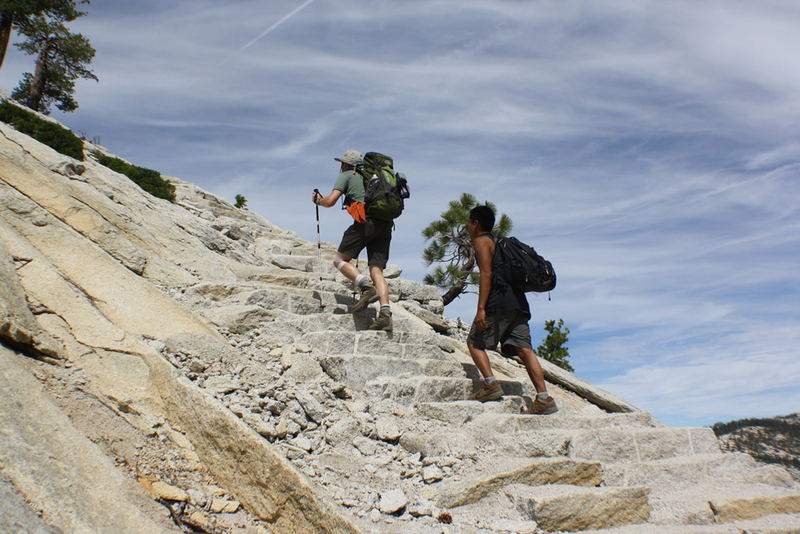 Be smart about evaluating whether you’re prepared for this hike. Footwear: Broken-in hiking boots – meaning that you’ve walked around in them for the equivalent of one week – are a must. 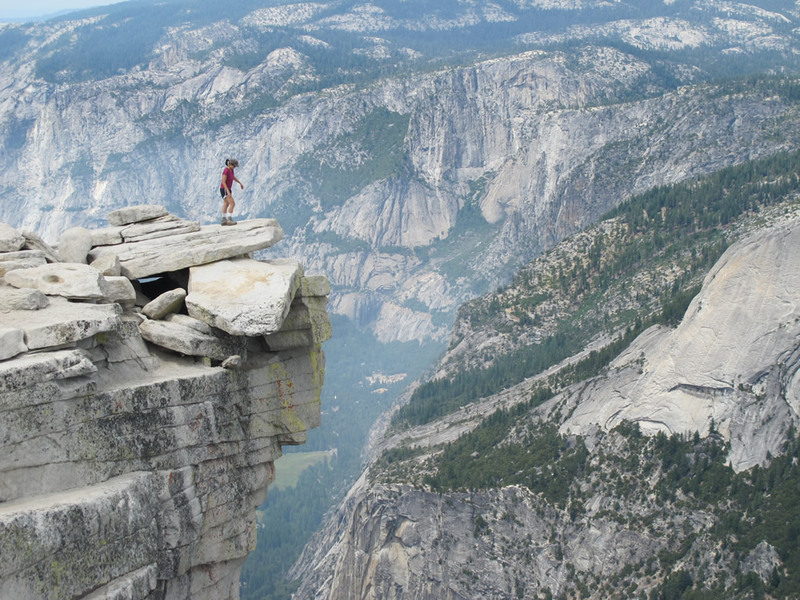 Yes, you will see people doing the hike barefoot or wearing Vibrams or sandals, but just because they’re crazy doesn’t mean you should be too. 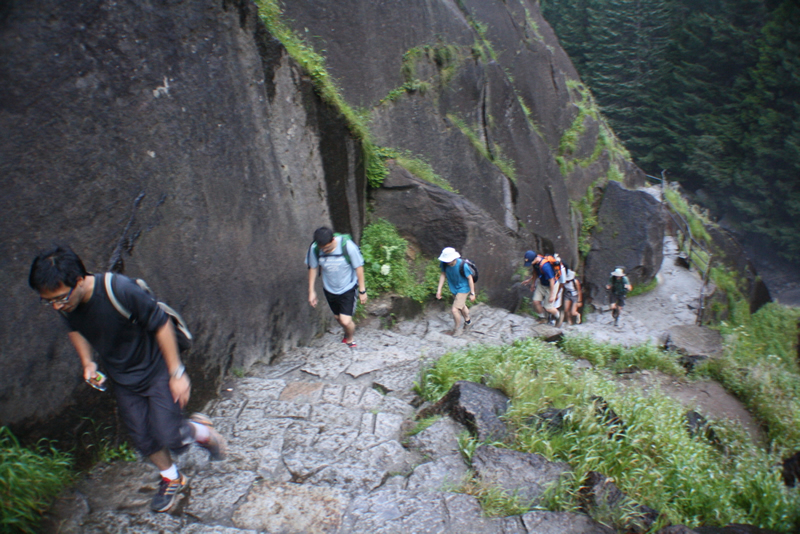 Clothes: You will be cold and soaking wet at the beginning of the hike, and sweating buckets at the end. So bring a light waterproof jacket for the morning and wear a quick-drying or wicking shirt, shorts and underwear made of synthetic material underneath. Do not forget a hat either. 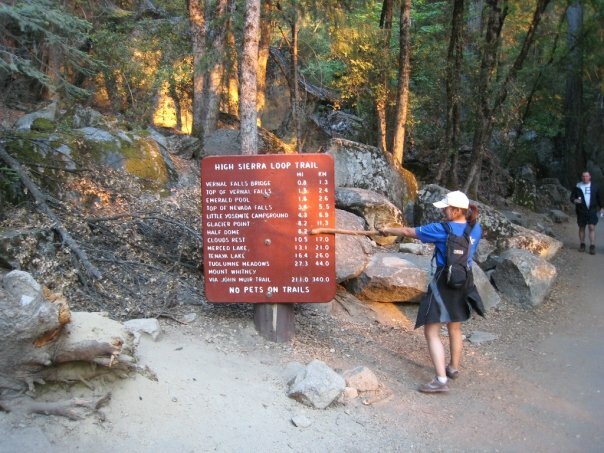 Food and Water: Depending on your body weight, you will burn between 2500-4000 calories on this hike. Stock up on easily-digestible, non-melting food. My sustenance of choice was: tortilla filled with almond butter, strawberry jam, Greek yogurt, Nutella, honey and fresh blueberries. It seemed over-indulgent when I packed it, but immediately after eating one on the summit, I was still starving. Having enough water – at least one gallon – is also essential. I’m a pretty small person and drained 3 liters dry by the summit. 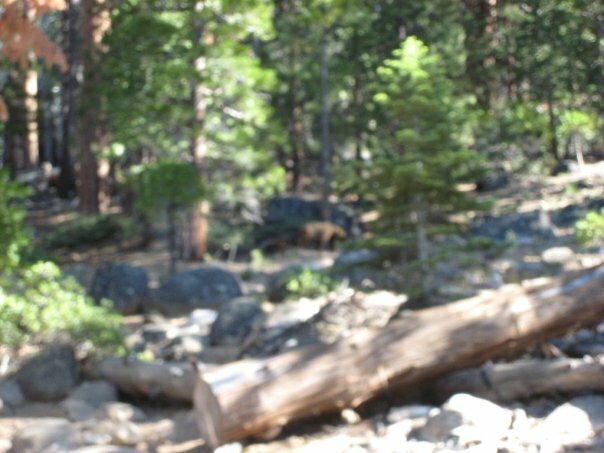 Fortunately, we had a water filter and could refill at the river in Little Yosemite Valley on the way down. If you sweat a lot, bringing some Gatorade in addition to water wouldn’t be a bad idea. Other gear: Bring gloves for the cables as your palms will be rubbed raw otherwise. 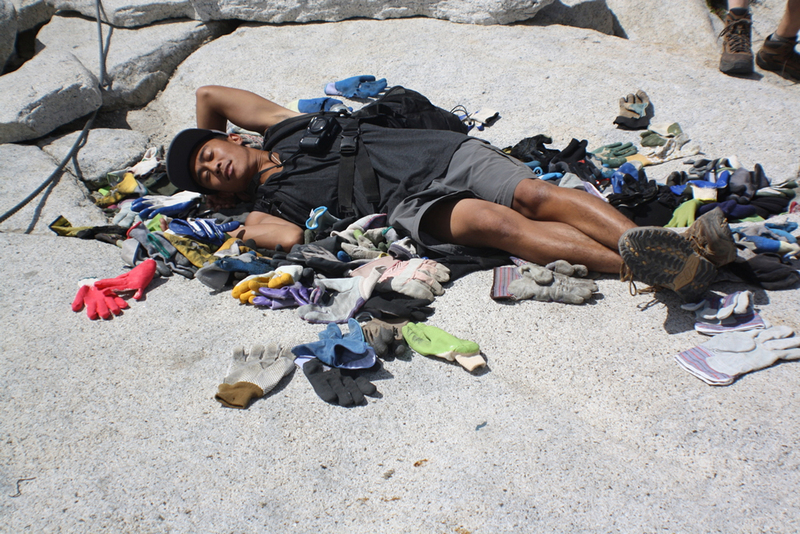 If you’re feeling adventurous, grab a pair from the glove pile at the base of the cables – cleanliness not guaranteed. If you have knee or IT band problems (I overpronate like crazy) get sole inserts and trekking poles. 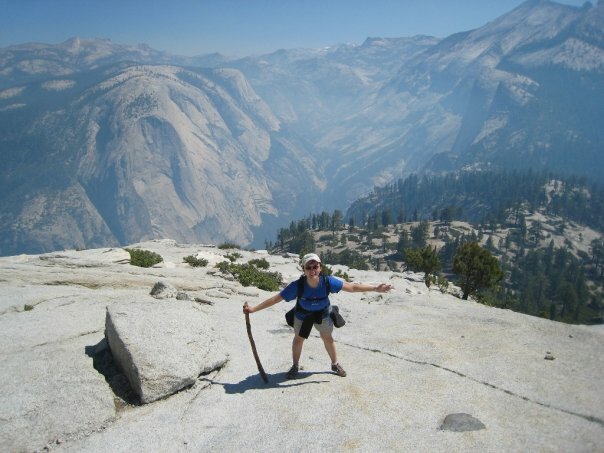 I used to think that hikers using poles were silly – until I got my own pair and found that it cut my effort level almost in half. Imagine all of the thousands of pounds of pressure on your knees and ankles over the course of 12 hours, now distributed evenly amongst your arms and chest. Your body will thank you. Sunscreen: Do not forget this if you value your skin. The night before: Go to sleep by 10pm, you’ll need it. If you want to beat the rush and get back to your car at a reasonable time – get to the trailhead parking lot by 5am. This way you’ll actually get a parking spot, a spot in a bear locker for your extra food and food-like substances and will return by sunset. 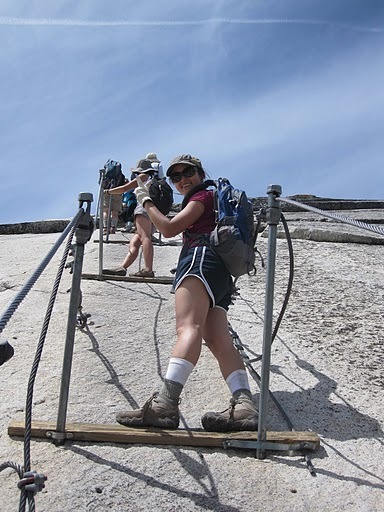 1) The shorter, steeper Mist Trail: You will curse the endless stairs and get soaked from the waterfalls in the process – making the Mist Trail live up to its name. You will also get spectacular views. 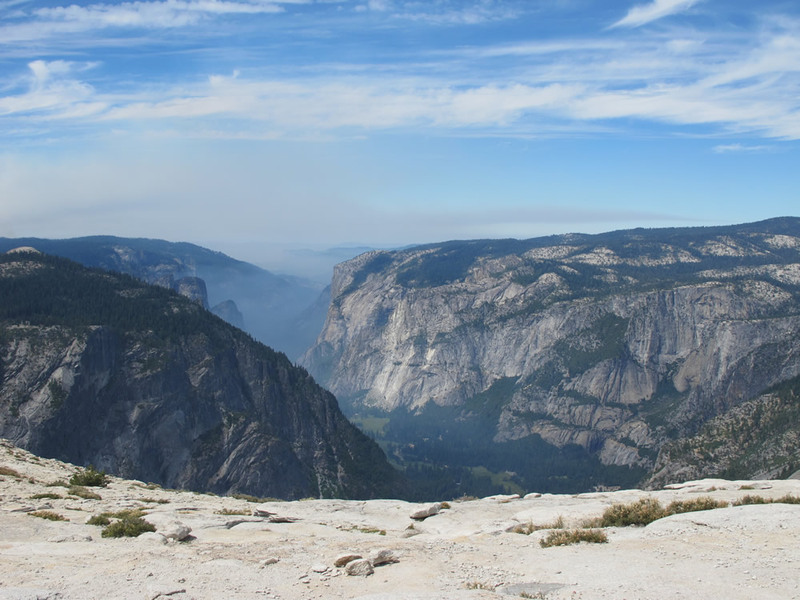 2) The longer, gentler John Muir Trail (JMT): This trail is about a mile longer than the Mist Trail but it’s a gentle slope all the way up. Make sure to step around the horse poo. This is the easiest portion of the hike. Flat almost the whole way, with beautiful, rolling meadows and deer that will dart across your path every once in awhile. Enjoy the scenery and prepare your quads for what’s coming next. This is also the last place with a toilet that does not involve squatting in the woods. This is the part where the rangers will collect your permits. 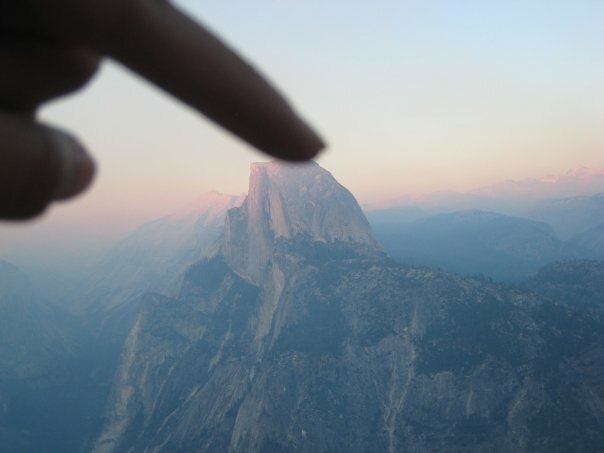 This is also the last place you can go relieve yourself, as the terrain is bare, exposed granite from here on. Take breaks under the few scraggly pine trees if you need to and yield to descending climbers. You’ll be at the scary part soon. REST. Eat your lunch and let some strength return to your body. Remember, you’ve just hiked 8 miles uphill just to get to this point. When you’re ready, go to the base of the cables. You may be tempted to leave your bag behind – I would advise against this since the squirrels and marmots that live all around have been known to rip bags apart looking for food. If you didn’t bring your own gloves, grab a pair from the communal pile and hope they’re sanitary. 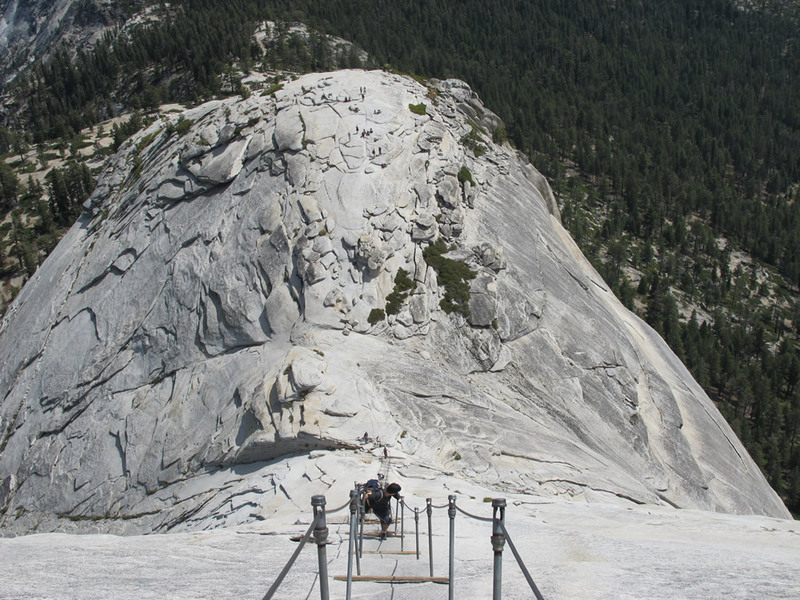 Climbing the cables requires walking up a granite surface at a 45-degree incline. This doesn’t sound like much until you realize that the world’s steepest street is only at a 35-degree incline. 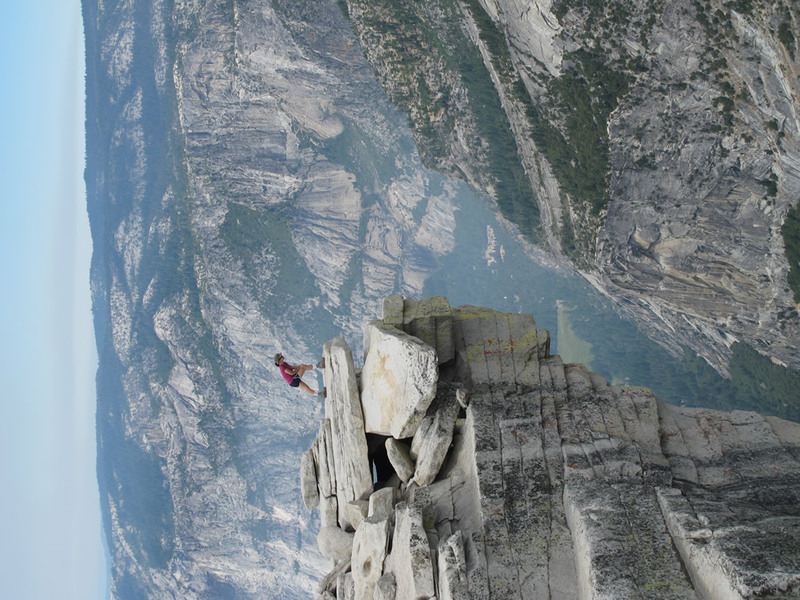 Your feet will slip all around on the rock, so you’ll have to use a lot of arm strength to pull yourself up. There are wooden planks every couple of yards that you can stand on to rest. Tip: when stopping on a wooden plank, lean forward towards the mountain to rest most effectively. And for the sake of everyone’s safety, try never have more two people standing on a plank – one going up and one going down – at any time. This part is hard, but your reward is so, so close. Incredible views from all sides. Walk around and indulge in your accomplishment. If you’re feeling adventurous, go to the Diving Board and have someone take a photo of you from the opposite ledge. And take a nap if you want. You have a long way to go down the mountain in the afternoon. This part should have been a lot easier than it was. But given that you’re really tired and your knees are about to take a pounding vertical mile descent, prepare to take as long with your descent as with the climb. Cables: I prefer to slide down backwards (holding both cables) rather than sliding down as you face forward. In any case, prepare for traffic because if you left around 5am as suggested, the main rush of hikers will just be coming up. 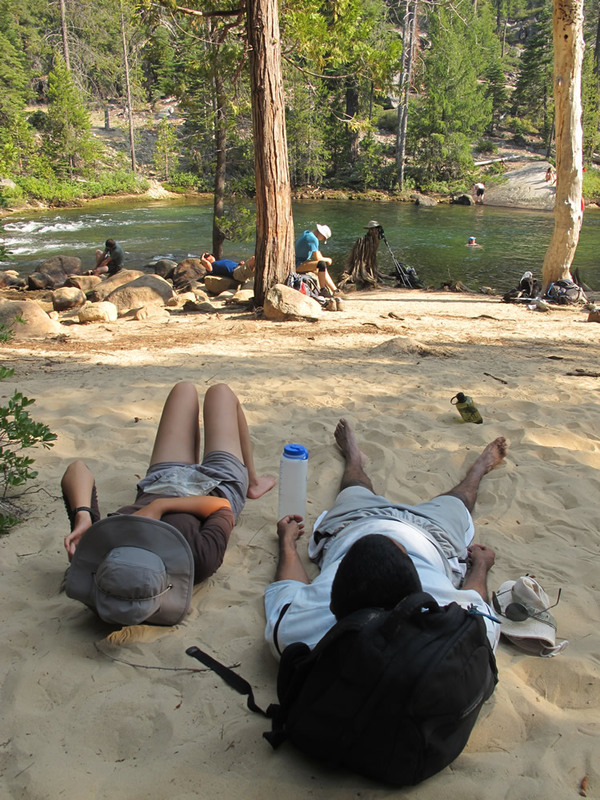 Pit stop at Merced River: You’re probably tired and running out of water by the time you reach Little Yosemite Valley, so head over to the Merced River nearby to rest and filter some more drinking water. 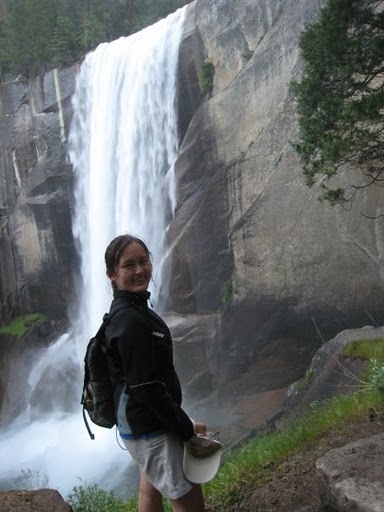 Mist Trail vs John Muir Trail return: If you don’t have knee problems, take the Mist Trail back. It’s scenic and shorter. If you do, JMT is a better bet, but insect repellent is essential on JMT. That’s because horses drop poo throughout the day on this trail and by late afternoon, the mosquitos will eat you alive if you pause for a split second. Before you know it, you’re back at the start and done for the day. 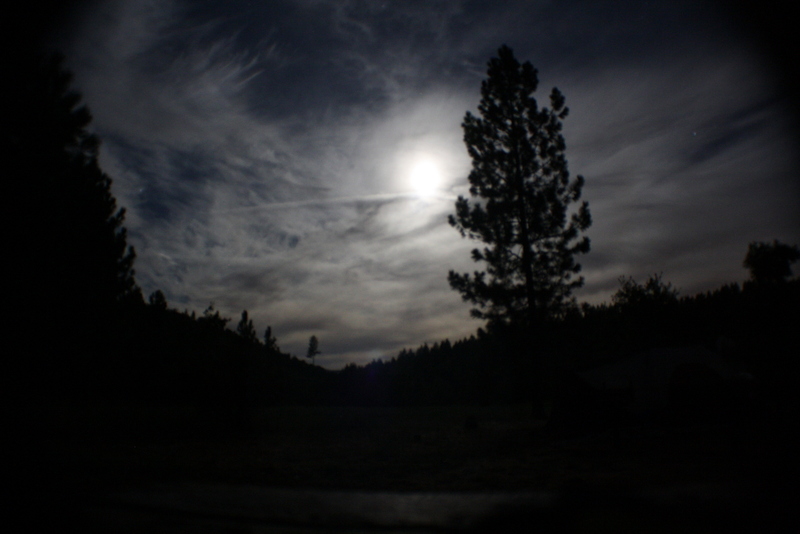 We were camping for a second night, and dinner made all my aches and pains go away. 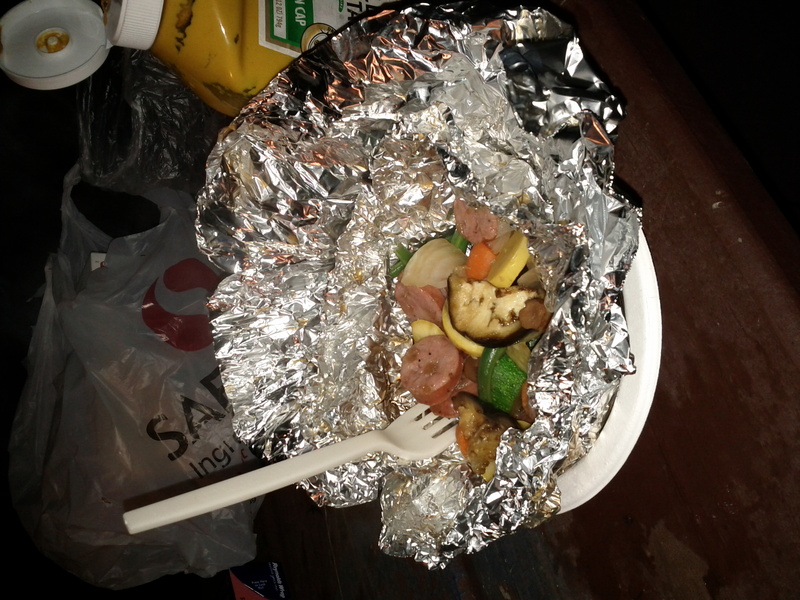 Hobo meals are an amazing post-hike dinner: mix chopped chicken apple sausage, hot links, eggplant, carrots, zucchini, onion and garlic with a splash (or two) of a dark Belgian ale, wrap twice in aluminum foil and slide into the coals of a campfire. Ready to eat in 20 minutes and taste great with mustard and hot sauce. This entry was posted in Uncategorized and tagged fitness, nature, sports, travel by jyzhou. Bookmark the permalink. Thank you, Julie, for your sharing your experience and advice! I love the added humor that actually put me at ease! 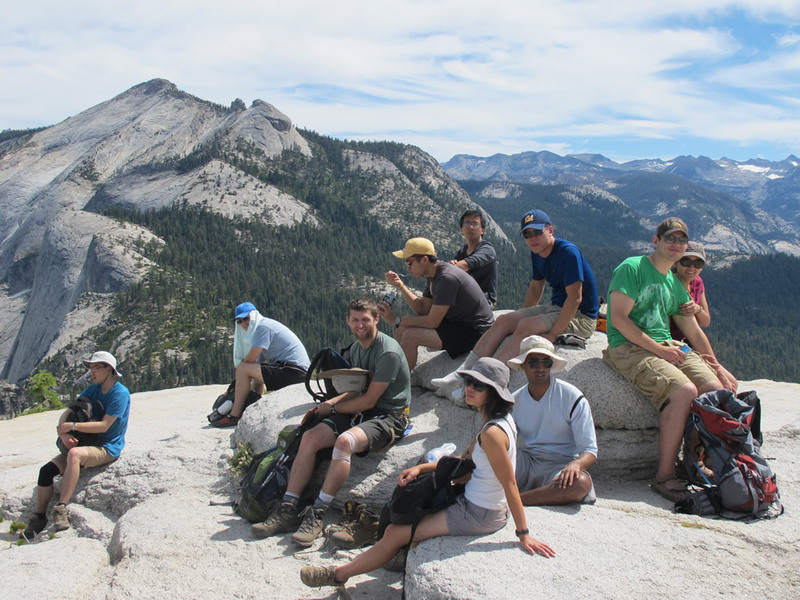 I’ll be making the venture hike this coming Monday, June 23rd.